This paper considers the importance of relationships in the constitution of personhood in the pre-Columbian American Bottom Region. 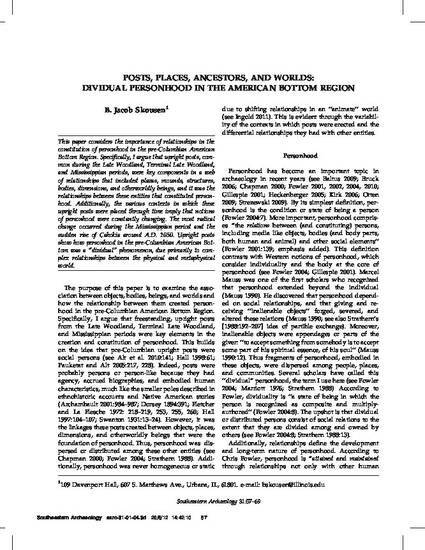 Specifically, I argue that upright posts, common during the Late Woodland, Terminal Late Woodland, and Mississippian periods, were key components in a web of relationships that included plazas, mounds, structures, bodies, dimensions, and otherworldly beings, and it was the relationships between these entities that constituted personhood. Additionally, the various contexts in which these upright posts were placed through time imply that notions of personhood were constantly changing. The most radical change occurred during the Mississippian period and the sudden rise of Cahokia around A.D. 1050. Upright posts show how personhood in the pre-Columbian American Bottom was a "dividual" phenomenon, due primarily to complex relationships between the physical and metaphysical world.